In 1983 England for the third time hosted the Cricket World Cup. This World Cup also consisted of eight teams with Zimbabwe making their debut in the tournament. Group A comprised of England, Pakistan, Sri Lanka, and New Zealand while Group B comprised of India, West Indies, Australia, and Zimbabwe. England and Pakistan from Group A along with the West Indies and India from group B qualified for the semi-finals. There was a possibility of a mouth-watering encounter between traditional rivals meeting in the finals. However, that was not to be as it was India who had defeated England in the semifinals by 6 wickets and West Indies who defeated Pakistan by eight wickets made it to the finals. This was also the first time that New Zealand did not feature in the semi-finals of the World Cup. Earlier in the Group Stages India became the first team to defeat the West Indies in the history of the tournament when they won the match by 34 runs. They also became the second team to defeat the West Indies in the history of the tournament when they beat them in the finals by 43 runs to lift their maiden World Cup trophy. Some of the key stats from the tournament are mentioned below. 338/5 by Pakistan against Sri Lanka is the highest team total in the 1983 World Cup. 384 runs scored by David Gower of England is the most number of runs scored by a player in the 1983 World Cup. 175* scored by Kapil Dev against Zimbabwe is the highest individual score by a player in the tournament. 8 centuries were scored in the 1983 World Cup. These were scored by Kapil Dev of India (175*), David Gower of England (130), Viv Richards of West Indies (119), Trevor Chappell of Australia (110), Gordon Greenidge of West Indies (105*), Zaheer Abbas of Pakistan (103*), Imran Khan of Pakistan (102*) & Allan Lamb of England (102). 4 half-centuries scored by Graeme Fowler of England is the most number of half-centuries scored by a player in the 1983 World Cup. 18 wickets taken by Roger Binny of India is the most number of wickets taken by a player in the 1983 World Cup. 7/51 by Winston Davis of West Indies against Australia is the best bowling performance by a player in the 1983 Cricket World Cup. 8 five-wicket hauls were taken in the 1983 World Cup. These were taken by Winston Davis of West Indies (7/51), Ken MacLeay of Australia (6/39), Richard Hadlee of New Zealand (5/25), Ashantha de Mel of Sri Lanka (5/32 & 5/39), Vic Marks of England (5/39), Kapil Dev of India (5/43) & Abdul Qadir of Pakistan (5/44). 16 dismissals (Ct - 15, St - 1) by Jeff Dujon of West Indies is the most number of dismissals by a wicket-keeper in the 1983 World Cup. 5 (Ct - 5) dismissals by Syed Kirmani of India against Zimbabwe is the most dismissals by a wicket-keeper in an innings in the 1983 World Cup. 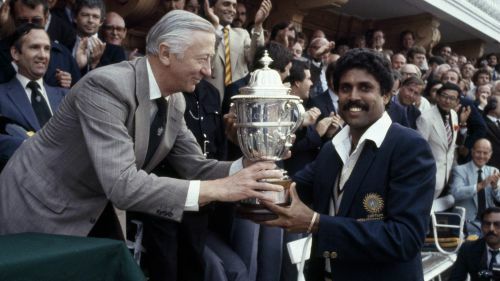 7 catches taken by Kapil Dev is the most number of catches taken by a player in the 1983 World Cup.